Details – When you book a Luxury All-Inclusive Vacation at Sandals Royal Plantation for 6 nights or more, you will receive a complimentary Island Routes Catamaran Cruise. Venture out across the flat, calm waters of the sparkling blue bay, as you embark on a cruise where you will explore the exotic beauty of underwater marine life and then live it up as you sail along the meandering coastline. Free Island Routes Adventure Tours Dunn’s River Falls Catamaran Cruise offer is available for new bookings in a concierge room category or higher made now until November 9, 2012 for travel now through December 26, 2013. Blackout dates apply. Offer is combinable with all other consumer savings promotions. 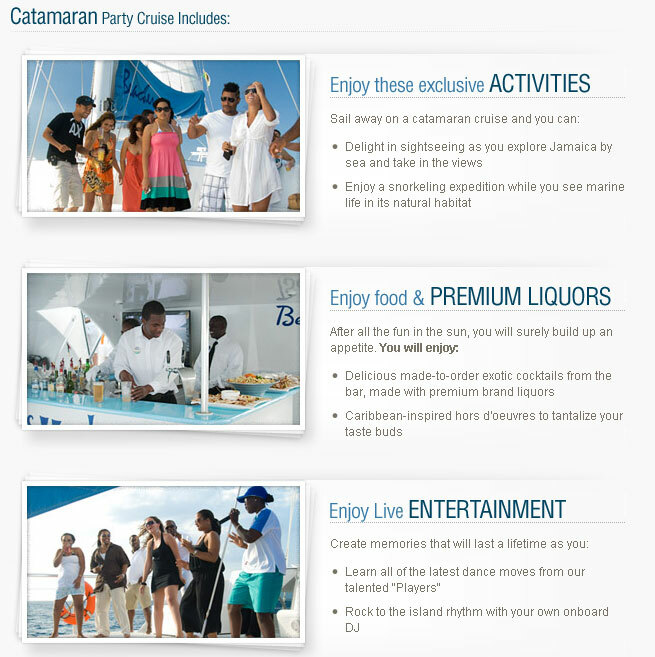 Offer includes one complimentary catamaran cruise per person, per room during the same stay. Offer is applicable to Dunn’s River Cruise Tour only. Upon check-in, visit the tour desk with your hotel travel voucher to redeem this offer. Space must be reserved on property at the Island Routes Adventure Tours Desk and is based on availability and suitable weather conditions. All excursion changes or cancellations are at the discretion of Island Routes. Offer is not applicable to groups. Offer has no cash value, is non-refundable, and non-transferable between persons in the room. Offer can be changed or withdrawn at any time.